Fleet-Up is a third-party website that allows you to manage fittings, doctrines, pilots and fleets. It is accessible via both in-game and out-of-game browsers, making importation of fits into EVE easy. All E-UNI Campuses, as well as the Incursion community, maintain doctrines on Fleet-Up. The direct link to the EVE University group on Fleet-Up is http://eveuni.fleet-up.com/. 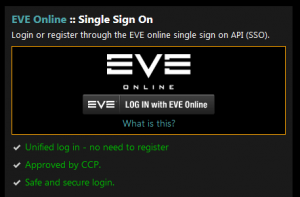 Do not use your EVE or UNI login credentials to register. You can however sign up using EVE Online: Single Sign On, to sign in with your EVE Online details without having to create an account first. Saves time and is secure (see more details of SSO here). Remember to sign-on using an account with an E-UNI character on it. If your Fleet-Up account includes an E-Uni character, you will be able to join it automatically. Manual applications to join the EVE University group will be rejected. The most likely issue is not setting up the API properly before you try to join the EVE University group. If you have joined EVE University very recently, or joined Fleet-Up only just now, the cache used by the ESI API may not yet have refreshed to reflect this change, so wait a few hours. If you are having issues, ask a campus officer (or ask in E-UNI channels) for assistance. If you are still having issues, contact Kaein Soturus or Azmodeus Valar . If you are a frequent guest FC and would like access without an API you should contact the Director of Special Projects. Here you can either click on each hull type, or use the search field to narrow your search. A list of doctrines will appear, select the doctrine you wish to view. This page was last modified on 1 March 2019, at 04:20.